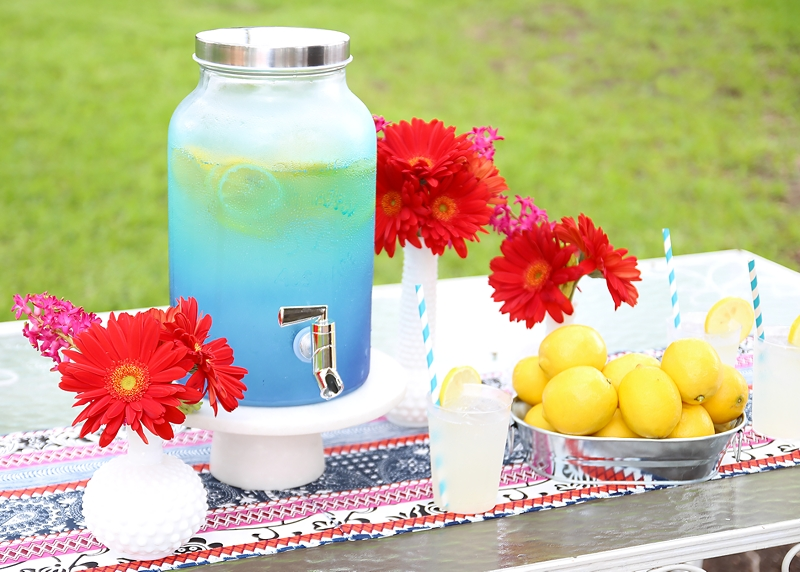 Make your summer gathering one to remember with this quick and easy drink dispenser. Remove spigot from drink dispenser and set aside. With small piece of painter's tape, cover the spigot opening from the inside of the dispenser. Wipe down the glass drink dispenser with glass cleaner. Shake each can of spray paint for approximately one minute to insure an even spray. Start with Krylon® Stained Glass Paint in Cobalt Blue, and spray along the bottom of the dispenser, stopping at about one-third of the way up. Repeat until color intensity desired has been achieved. Starting just above the Cobalt Blue, begin to spray upwards using Krylon® Stained Glass Paint in Soft Blue, stopping at the two third mark of the dispenser. With either color, lightly spray where the two colors meet to give an ombre appearance. Remove the tape, and replace the spigot.